Song, W., Wei, W., Wang, D., and Zhang, S. (2017). "Preparation and properties of new plywood composites made from surface modified veneers and polyvinyl chloride films," BioRes. 12(4), 8320-8339. To reduce the formaldehyde emissions of plywood used in furniture and interior decorations, new plywood composites made from surface modified veneers and polyvinyl chloride films were developed. These films were used as formaldehyde-free adhesives, and the veneer surfaces were modified with 3-aminopropyl(triethoxy)silane to enhance the compatibility with the films. Hot-pressing of composites was optimized using a response surface methodology. The effects of 3-aminopropyl(triethoxy)silane modification on various properties of veneers and composites were studied by Fourier transform infrared spectroscopy, contact angle, physico-mechanical, scanning electron microscope, dynamic mechanical, and thermogravimetric analyses. The optimum hot-pressing process for the composites was 183 °C (temperature), 74 s/mm (duration), and 312.5 g/m2 (adhesive). The modification with 3-aminopropyl(triethoxy)silane enhanced the hydrophobicity of veneer surfaces and improved the interfacial adhesion and physico-mechanical properties of composites. Adding 3% 3-aminopropyl(triethoxy)silane resulted in approximately 40% of decrease in water adsorption of composites and 30% increase in wet shear strength. The 3-aminopropyl(triethoxy)silane modification also improved the thermal stability of composites. The physico-mechanical properties of both the unmodified and modified composites met the requirements in Chinese national standard GB/T 9846 (2015) for the water-resistant plywood, indicating the potential of proposed composites as new building materials. As an important wood-based composite, plywood is commonly used in furniture and interior decoration (Song et al. 2016). In the manufacture of plywoods, formaldehyde-based resins are the most widely used wood adhesives, especially urea-formaldehyde resin, due to its simple synthetic process, low cost, water solubility, fast curing, and good performance (Song et al. 2017). However, these resins usually cause plywood to have a high formaldehyde emission (Song et al. 2015a). Because formaldehyde is classified as a human carcinogen, developing formaldehyde-free adhesives and environmentally friendly plywood has become a hot interdisciplinary topic in the fields of materials and environmental sciences (Zhang et al. 2015). In previous studies, significant efforts have been made to reduce the formaldehyde emission from plywoods, e.g., by reducing or replacing the formaldehyde content in adhesive formulations, or by developing adhesives from natural materials (Fang et al. 2013a; Liao et al. 2016; Di et al. 2017; Liu et al. 2017). However, the supply of these new adhesives is limited because they usually have a high modification cost or a low water resistance (Fang et al. 2013a; Wu et al. 2016). Recently, research on natural fiber-reinforced plastic composites has become a hot topic in the plastics industry, and this also inspires the study of environmentally friendly wood-based composites (Ren et al. 2014; Song et al. 2015b; Ma et al. 2016; Qi et al. 2016; Sun et al. 2017). For example, plastic films have been used by some researchers as formaldehyde-free adhesives to prepare new environmentally friendly wood-plastic plywoods (Fang et al. 2013a,b, 2014; Chang et al. 2016; Song et al. 2016; Chang et al. 2017; Fang et al. 2017; Song et al. 2017). As the most widely used packaging materials, plastic films are inexpensive, water-resistant, and relatively tough, thus offering many environmental and technological benefits when used as wood adhesives (Fang et al. 2013a). While wood-plastic plywoods bonded with polyethylene films and polypropylene films have been explored, the plywoods bonded with other commonly used plastic films such as polyvinyl chloride films are rarely reported (Song et al. 2017). Polyvinyl chloride is a thermoplastic resin generated by the homopolymerization of vinyl chloride or by the copolymerization of other monomers (Wang et al. 2015a). Currently, polyvinyl chloride has among the highest market shares of polymeric materials, and its price is usually lower than that of the polyethylene or the polypropylene previously used in wood-plastic plywoods (Xie et al. 2014). Generally speaking, polyvinyl chloride can be processed into all sorts of plastic materials through mixing, plasticization, and molding (Wang et al. 2015a). By using different types and proportions of processing aids, various hard, semi-hard, soft, transparent, and non-transparent polyvinyl chloride materials can be produced (Wang et al. 2015a). Typically, polyvinyl chloride products can include copolymers or alloys, synthetic fibers, engineering plastics, coatings, elastomers, foams, sealants, and different types of special functional materials (Wang et al. 2015a). Reportedly, polyvinyl chloride materials have good fire resistance and high strength; thus they have been extensively used in industrial applications such as packaging materials, toys, and construction materials (Xie et al. 2014; Wang et al. 2015a). In the plastics industry, natural fiber-reinforced polyvinyl chloride composites have been found to possess high stiffness, strong chemical resistance, and good flame retardation due to the chlorine atoms in polyvinyl chloride molecules; therefore, they are recognized as being suitable for building and construction applications (Chaochanchaikul et al. 2011; Xu et al. 2016). Considering the abundant advantages of polyvinyl chloride mentioned above, a study on the polyvinyl chloride film-bonded plywoods may open a new way for the development of wood-plastic plywoods. Generally speaking, two topics must be studied when developing the new wood-plastic plywoods. The first topic is the hot-pressing process of wood-plastic plywoods. For example, the melting temperature of plastic film is usually higher than the reaction temperature of urea-formaldehyde resin (Song et al. 2016); thus, the hot-pressing temperature of wood-plastic plywoods may be very different from conventional urea-formaldehyde plywoods. However, the optimum hot-pressing process for polyvinyl chloride film-bonded plywoods is still unknown. The second topic is the interface modification of wood-plastic plywoods. Typically, there is a poor interfacial compatibility between the hydrophilic veneer surfaces and the hydrophobic plastic films, which usually results in a poor interfacial adhesion and inferior physical-mechanical properties for the wood-plastic plywoods (Fang et al. 2014). There are similar problems in the research on natural fiber-reinforced plastic composites, because there is a low interfacial compatibility between the hydrophilic natural fibers and the hydrophobic plastics in general (Lu et al. 2014). In the plastics industry, coupling agents (such as silane or maleic anhydride grafted polypropylene) are usually used to improve the interfacial adhesion of natural fiber-reinforced plastic composites (Song et al. 2015b; Zhang et al. 2016). Recently, these coupling agents have been used in the preparation of polyethylene film- or polypropylene film-bonded plywoods, and they have been found to be effective in enhancing the interaction between the veneer surfaces and plastic films (Fang et al. 2014; 2016a,b; Song et al. 2017). However, the effect of the silane surface modification of veneers on the properties of polyvinyl chloride film-bonded plywoods is still unknown. To aid in the study on wood-plastic plywoods, this research developed new plywood composites made from the surface modified veneers and polyvinyl chloride films, in which the polyvinyl chloride films were used as formaldehyde-free adhesives, and the veneer surfaces were modified with 3-aminopropyl(triethoxy)silane to enhance the compatibility with polyvinyl chloride films. In detail, the objectives of this paper were as follows: (1) to determine the optimum hot-pressing process for the composites, and (2) to study the effect of the surface modification of veneers on various properties of the composites. The wood veneers (species, Eucalyptus; dimensions, 400 × 400 × 1.5 mm3; and moisture content, 9%) were purchased from a plantation (Liuzhou, Guangxi Region, China). The polyvinyl chloride films (thickness, 0.03 mm; area density of one layer, 62.5 g/m2) were purchased from Huadun Snowflake Plastics Group Co., Ltd. (Beijing, China). The modifier 3-aminopropyl(triethoxy)silane (density, 0.94 g/mL) was purchased from Lanyi Chemical Products Co., Ltd. (Beijing, China). When preparing the modifier-treated veneers, the modifier 3-aminopropyl (triethoxy)silane was diluted in ethanol and alcoholyzed for 1 h. The modifier solution was sprayed on veneer surfaces. The treated veneers were air-dried for 24 h and then oven-dried at 105 °C for 2 h. The modifier dosage used for treating the veneer surfaces included 0%, 1%, 3%, and 5%, which were expressed as a weight ratio of modifier to veneers. To make plywood composites, a mat was prepared by stacking three veneers. For the adjacent two veneers, the grain directions were perpendicular to each other. Between every two veneers, polyvinyl chloride films were added as an adhesive, with an adhesive dosage of 125 g/m2 to 375 g/m2. The mat was hot-pressed at a hot-pressing temperature of 160 °C to 200 °C for a hot-pressing duration of 50 s/mm to 90 s/mm, under a hot-pressing pressure of 1 MPa. Subsequently, the mat was cold-pressed at room temperature at a pressure of 1 MPa for a duration of 80 s/mm. The pressing duration for composites was expressed as a ratio of the total time of hot-pressing to the thickness of plywoods. The calorimetric data of polyvinyl chloride films were obtained by using a DSC-60 differential scanning calorimeter (Shimadzu, Kyoto, Japan), under a 50 mL/min nitrogen flow, from room temperature to 180 °C at a heating rate of 10 °C/min. The water adsorption, thickness swelling, flexural strength (or called the modulus of rupture), flexural modulus (or called the modulus of elasticity), and shear strength of composites were measured according to Chinese National Standard GB/T 17657 (2013). The water adsorption and thickness swelling were measured after the composites were immersed in 20 °C water for 24 h. The flexural strength and flexural modulus were measured using a three-point flexural test. The shear strength was measured after the composites were immersed in 63 °C water for 3 h. The measurements were repeated nine times. The mechanical measurements were performed using a MWW-50 universal mechanical testing machine (Tayasaf Corporation, Beijing, China). The microscopic images of the sides of plywoods were taken by an S-3400N scanning electron microscope (Hitachi, Tokyo, Japan), with an acceleration voltage of 5 kV. Before the observation, the samples were sputter-coated with gold. The infrared spectra of veneer surfaces were obtained with a Nicolet 6700 Fourier transformation infrared spectrometer (Thermo Fisher Scientific, Waltham, MA, USA), with a scanning range from the wavenumber of 400 cm-1 to 4000 cm-1 at a resolution of 4 cm-1, and a scan number of 200. The contact angle data of veneer surfaces were measured using an OCA20 contact angle meter (DataPhysics Instruments GmbH, Filderstadt, Baden-Württemberg, Germany), with the distilled water as a test liquid. The storage modulus, loss modulus, and loss factor of composites (60 × 14 × thickness, mm3) were measured by a DMA Q800 dynamic mechanical analyzer (TA Instruments, New Castle, DE, USA), in a dual-cantilever mode, at a frequency of 1 Hz, and an amplitude of 30 µm, from room temperature to 200 °C at a heating rate of 5 °C/min. The thermal weight loss of composites was measured using a TGA Q500 thermogravimetric analyzer (TA Instruments), under a 60 mL/min nitrogen flow, from room temperature to 600 °C at a heating rate of 10 °C/min. In this part, according to a Box-Behnken design, a response surface methodology was used to study the effect of hot-pressing temperature, hot-pressing duration, and adhesive dosage on the shear strength of composites made from the 0% modifier-treated veneers. The experimental design and the experimental data are shown in Table 1. The data were analyzed by using a software Design-Expert. V8.0.6 (Stat-Ease, Inc., Minneapolis, MN, USA). Finally, the optimum levels of hot-pressing temperature, hot-pressing duration, and adhesive dosage for preparing the composites were determined, according to the shear strength of composites. In this part, using the optimum hot-pressing process determined in the response surface methodology study, the composites made from the 0%, 1%, 3%, and 5% modifier-treated veneers were prepared. The modifier-treated veneers were characterized by Fourier transform infrared spectroscopy and contact angle analyses, and the modifier-treated composites were characterized by the scanning electron microscopy, physical-mechanical, dynamic mechanical, and thermogravimetric analyses. Finally, the optimum level of modifier dosage for preparing the composites was determined, according to the physical-mechanical properties of composites. In the Chinese national standard GB/T 9846 (2015), the flexural strength, flexural modulus, and shear strength (from the physical-mechanical analysis) are the required properties for the plywood; thus the three results will have the most impact for a possible use of this type of panel. The differential scanning calorimetry data indicated that the melting temperature of polyvinyl chloride films was 140 °C. In order to make the polyvinyl chloride films have a desirable mobility during the hot-pressing process, the hot-pressing temperature must be over the melting temperature (Song et al. 2017). However, the hot-pressing temperature should not be over 200 °C, because a high temperature could cause wood pyrolysis (Song et al. 2017). Therefore, the hot-pressing temperature levels used in the response surface methodology study (Table 1) were 160, 180, and 200 °C. The data from experiments No. 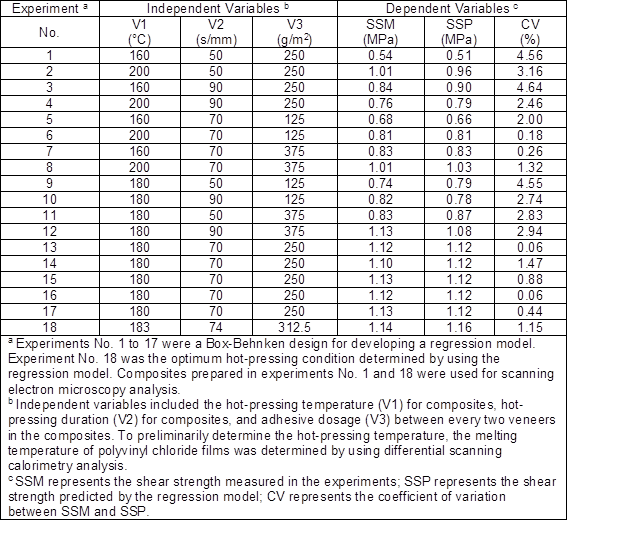 1 to 17 (Table 1) were used to develop a regression model (Table 2) for predicting the shear strength of the composites. As shown in Table 2, the model had a coefficient of variation below 10%, an R2 (or called the coefficient of determination) and adjusted R2 over 0.9, and an adequate precision (or called the signal/noise ratio) over 4. Therefore, the model should be acceptable, according to available reports on the response surface methodology study (Wang et al. 2015b). Using the model, the optimum levels of hot-pressing temperature, hot-pressing duration, and adhesive dosage for preparing composites were determined and validated, which were 183 °C, 74 s/mm, and 312.5 g/m2, respectively (see experiment No. 18 of Table 1). 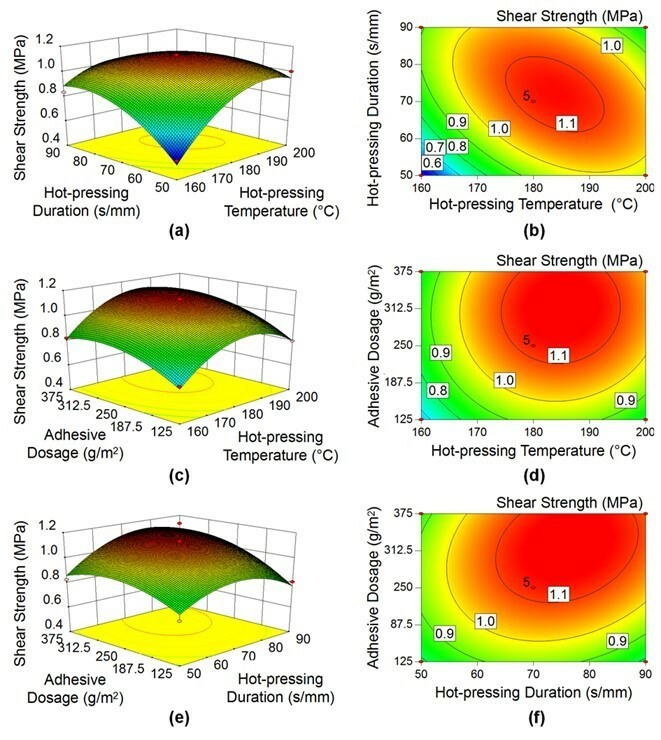 The effect of hot-pressing temperature, hot-pressing duration, and adhesive dosage levels on the shear strength of composites was simulated by using the regression model, as shown in Fig. 1. The analysis of variance for the regression model is shown in Table 3. As indicated in Table 3, the hot-pressing temperature and hot-pressing duration had significant effects on the shear strength of the composites. When the hot-pressing temperature and hot-pressing duration were below 183 °C and 74 s/mm, respectively, an increase of their levels caused an increase of the shear strength of the composites. This might be because a high hot-pressing temperature or a long hot-pressing duration could make the polyvinyl chloride films have a desirable mobility during the hot-pressing process, which could make the veneer surfaces well encapsulated by polyvinyl chloride films, and also could allow a desirable penetration of polyvinyl chloride films into wood, thus producing strong adhesive bonded joints in the composites (Song et al. 2017). When the hot-pressing temperature and hot-pressing duration were over 183 °C and 74 s/mm, respectively, the shear strength of the composites were decreased with the increase of their levels. This might be because a high hot-pressing temperature or a long hot-pressing duration could make the polyvinyl chloride films have a very low viscosity during the hot-pressing process, which could cause an excessive penetration of polyvinyl chloride films into wood, resulting in a shortage of adhesives between the adjacent two veneers (Song et al. 2017). As indicated in Table 3, the adhesive dosage had a significant effect on the shear strength of the composites. When the adhesive dosage was below 312.5 g/m2, an increase in the adhesive dosage level increased the shear strength of the composites. This might be because a high adhesive dosage could ensure the presence of a sufficient amount of polyvinyl chloride film, which could make the veneer surfaces well encapsulated by the polyvinyl chloride films, thus producing abundant adhesive bonded joints in composites (Song et al. 2017). When the adhesive dosage was over 312.5 g/m2, the increase of the adhesive dosage level caused a decreased shear strength of the composites. This might be because a high adhesive dosage could produce a thick bondline between the adjacent two veneers, thus weakening the adhesion between the adjacent two veneers, because of the inferior mechanical properties of plastic films compared with wood (Song et al. 2017). As shown in Fig. 2, the hot-pressing temperature, hot-pressing duration, and adhesive dosage had obvious effects on the microscopic morphologies of composites. In the composites prepared in experiment No. 1, a bondline was observed between the adjacent two veneers, indicating that the penetration of polyvinyl chloride films into the veneer surfaces was not desirable, which could easily cause the delamination of polyvinyl chloride films from the veneer surfaces. Therefore, the composites prepared in experiment No. 1 had the lowest shear strength in Table 1. In the composites prepared in experiment No. 18, the penetration of polyvinyl chloride films into the veneer surfaces was better than that in experiment No. 1, which could produce stronger adhesive bonded joints in the composites. Therefore, the composites prepared in experiment No. 18 had the highest shear strength in Table 1. 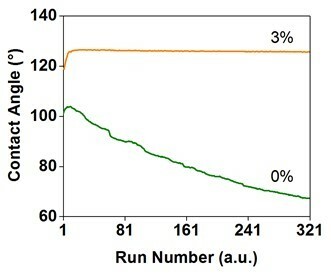 The infrared spectra of the 0% and 3% modifier-treated veneer surfaces are shown in Fig. 3. The peaks from Si-O-C groups (1120 cm-1) and C-H groups (1340 cm-1, 1380 cm-1, 1470 cm-1, 2860 cm-1, and 2920 cm-1) were higher in the spectra of the 3% modifier-treated veneer surfaces (Fang et al. 2014; Luo et al. 2014; Liu 2015). However, the peaks from O-H groups (1640 cm-1 and 3440 cm-1) were higher in the spectra of the 0% modifier-treated veneer surfaces (Luo et al. 2014; Liu 2015). This might be because 3-aminopropyl(triethoxy)silane could be converted into silanol, and be grafted onto wood surfaces (Fig. 4) (Fang et al. 2014). After the 3-aminopropyl(triethoxy)silane modification, the introduction of silanol onto the veneer surfaces could increase the content of Si-O-C and C-H groups on the veneer surfaces, and the reaction between the silanol and veneer surfaces could reduce the content of O-H groups on the veneer surfaces. As shown in Fig. 5, the 3% modifier-treated veneer surfaces had a higher initial contact angle than the 0% modifier-treated veneer surfaces. With the increase of time, the contact angle of the 0% modifier-treated veneer surfaces obviously decreased, but the contact angle of the 3% modifier-treated veneer surfaces were changed only slightly. 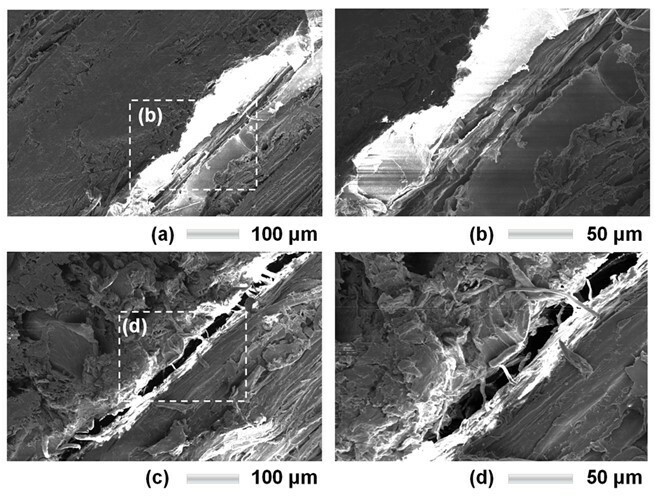 These results indicated that the 3% modifier-treated veneer surfaces had a higher hydrophobicity than the 0% modifier-treated veneer surfaces (Fang et al. 2014). This might be because the 3-aminopropyl(triethoxy)silane modification increased the content of hydrophobic C-H groups and reduced the content of hydrophilic O-H groups on the veneer surfaces (Fig. 4). 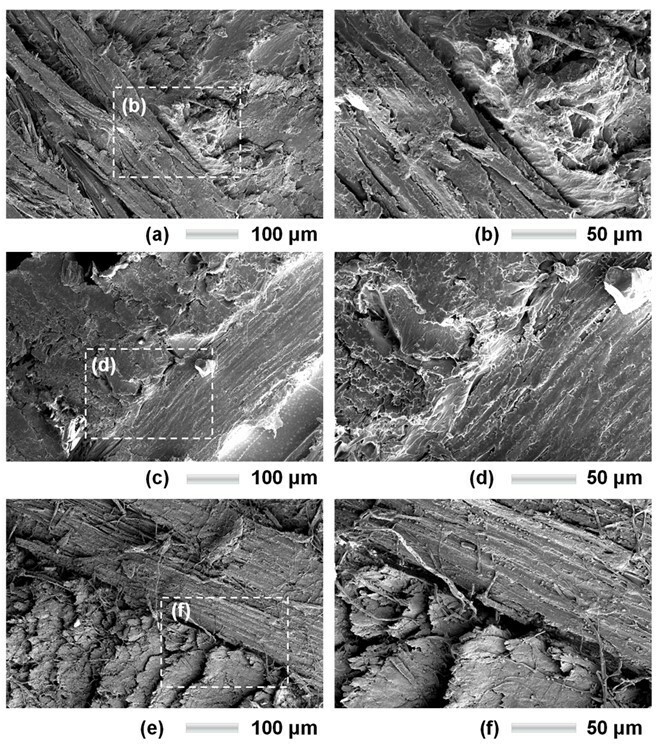 The microscopic images of the 0% modifier-treated composites are shown in Figs. 2c and 2d, and the microscopic images of the 1%, 3%, and 5% modifier-treated composites are shown in Fig. 6. In the 0% modifier-treated composites, there were some gaps between the adjacent two veneers. This might be because there was a low interfacial compatibility between the hydrophilic veneer surfaces and the hydrophobic polyvinyl chloride films, making the veneer surfaces not well encapsulated by polyvinyl chloride films (Lu et al. 2014). In the 1% modifier-treated composites, there were gaps between the adjacent two veneers, but the gaps were smaller than those in the 0% modifier-treated composites. This might be because the 3-aminopropyl(triethoxy)silane modification enhanced the hydrophobicity of veneer surfaces (Fig. 5), which could improve the interfacial compatibility between the veneer surfaces and polyvinyl chloride films, making the veneer surfaces well encapsulated by polyvinyl chloride films. In the 3% modifier-treated composites, there was almost no gap between the adjacent two veneers, indicating a better interfacial adhesion than the 1% modifier-treated composites. This might be because a high modifier dosage could ensure the presence of a sufficient amount of 3-aminopropyl(triethoxy)silane modifier, which could further enhance the hydrophobicity of veneer surfaces, allowing an extensive interaction between the veneer surfaces and polyvinyl chloride films (Luo et al. 2014). In the 5% modifier-treated composites, there were some gaps between the adjacent two veneers, indicating that an increase in the modifier dosage from 3% to 5% weakened the interfacial adhesion of the composites. This might be because the presence of excessive 3-aminopropyl(triethoxy)silane modifier could enlarge the gaps between the veneer surfaces and polyvinyl chloride films (Lu et al. 2005), and the possible reasons were as follows. As shown in Fig. 4, the 3-aminopropyl(triethoxy)silane molecules could react not only with the veneer surfaces and but also with other 3-aminopropyl(triethoxy)silane molecules (Fang et al. 2014). When an excessive 3-aminopropyl(triethoxy)silane content was used to treat the veneer surfaces, the polymerization could occur between 3-aminopropyl(triethoxy)silane molecules, which could form a thick film on veneer surfaces (Luo et al. 2014). Such thick films formed could act as a barrier to reduce the interaction between the veneer surfaces and polyvinyl chloride films, thus enlarging the gaps between them (Luo et al. 2014). Fig. 6. Microscopic images of the (a and b) 1%, (c and d) 3%, and (e and f) 5% modifier-treated composites. The physical and mechanical properties of the 0%, 1%, 3%, and 5% modifier-treated composites are shown in Fig. 7. Compared with the 0% modifier-treated composites, the 1% modifier-treated composites had a lower water adsorption and thickness swelling, and a higher flexural strength, flexural modulus, and shear strength. This might be because the 3-aminopropyl(triethoxy)silane modification enhanced the hydrophobicity of veneer surfaces (Fig. 5), and improved the interfacial adhesion of composites (Fig. 6). The enhanced hydrophobicity of veneer surfaces could reduce the water uptake of veneers; moreover, the improved interfacial adhesion of composites could allow less water to enter the composites, and also could prevent the composites from swelling after water uptake (Fang et al. 2014). These results could make the composites have a higher resistance to the water uptake and thickness expansion, causing the decrease of the water adsorption and thickness swelling values. The improved interfacial adhesion of composites could cause a more efficient stress transfer in the composites (Lu et al. 2014), which could make the composites have a higher resistance to the flexural fracture and flexural deformation, causing an increase of the flexural strength and flexural modulus values. As mentioned above, the 3-aminopropyl(triethoxy)silane modification could improve the interfacial adhesion and water resistance of composites. Thus this modification could make the composites have a higher resistance to the shear fracture (after the composites were immersed in 63 °C water for 3 h), causing an increase of the shear strength values. 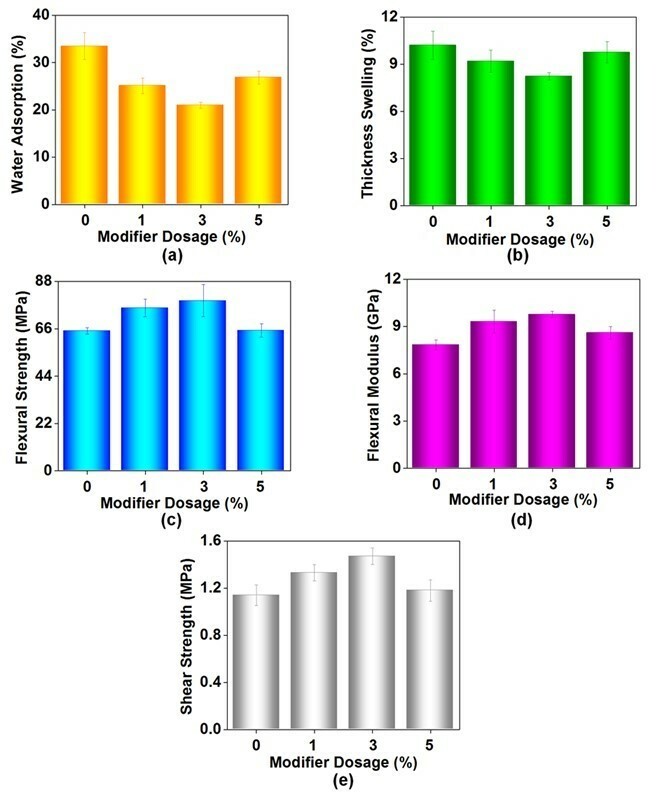 Compared with the 1% modifier-treated composites, the 3% modifier-treated composites exhibited lower values for water adsorption and thickness swelling, and higher values for flexural strength, flexural modulus, and shear strength properties. This might be because a high modifier dosage could ensure the presence of a sufficient amount of 3-aminopropyl(triethoxy)silane modifier, which could further enhance the hydrophobicity of veneer surfaces, and also could further improved the interfacial adhesion of composites (Luo et al. 2014). Compared with the 3% modifier-treated composites, the 5% modifier-treated composites showed higher values for the water adsorption and thickness swelling, and displayed lower values for the flexural strength, flexural modulus, and shear strength properties. This might be because excessive 3-aminopropyl(triethoxy)silane weakened the interfacial adhesion of composites (Fig. 6). Overall, the physical and mechanical properties of the 1%, 3%, and 5% modifier-treated composites were better than the 0% modifier-treated composites. The optimum level of the modifier dosage was determined to be 3%, because it caused the lowest water adsorption and thickness swelling, and the highest flexural strength, flexural modulus, and shear strength values, as shown in Fig. 7. Compared to the 0% modifier-treated composites, the 3% modifier-treated composites had a 37.38% and 19.41% decrease in the water adsorption and thickness swelling, respectively, and had a 21.60%, 24.65%, and 28.95% increase in the flexural strength, flexural modulus, and shear strength, respectively. In Chinese national standard GB/T 9846 (2015), the requirements for the water-resistant plywood (or called class II plywood) are as follows: flexural strength, 32.00 MPa; flexural modulus, 5.50 GPa; shear strength, 0.70 MPa. As shown in Fig. 7, the physical-mechanical properties of both the unmodified (with 0% modifier) and modified composites (with 1%, 3%, and 5% modifier) met the above standard requirements. The dynamic mechanical data of the 0% and 3% modifier-treated composites are shown in Fig. 8. An increase of temperature from room temperature to 200 °C caused a decrease of the storage modulus retention ratio (a ratio of the storage modulus to the initial storage modulus) and the loss modulus, but caused an increase of the loss factor (a ratio of the loss modulus to the storage modulus). This might be because the increase of temperature reduced the intermolecular forces between the polymer chains (Ren et al. 2014). The effect of 3-aminopropyl(triethoxy)silane modification on the dynamic mechanical data is discussed below. Fig. 8. 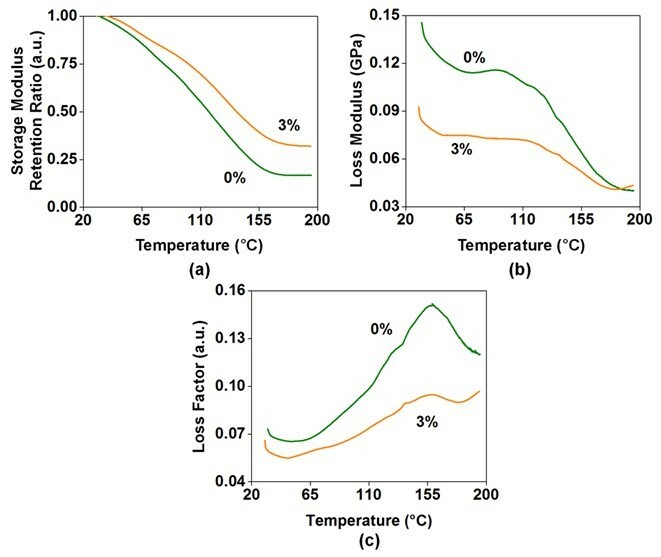 Dynamic mechanical data (a) storage modulus retention ratio, (b) loss modulus, and (c) loss factor of the 0% and 3% modifier-treated composites. As shown in Fig. 8a, the 3% modifier-treated composites had a higher storage modulus retention ratio than the 0% modifier-treated composites, indicating that the 3-aminopropyl(triethoxy)silane modification enhanced the stiffness of composites (Ren et al. 2014). This might be because the 3-aminopropyl(triethoxy)silane modification enhanced the interaction between the veneer surfaces and polyvinyl chloride films (see Fig. 6), which could result in a more efficient stress transfer in the composites (Lu et al. 2014). As shown in Fig. 8b, the 3% modifier-treated composites had a lower loss modulus than the 0% modifier-treated composites, indicating that the 3-aminopropyl(triethoxy) silane modification reduced the toughness of composites (Hao et al. 2016). This might be because the 3-aminopropyl(triethoxy)silane modification improved the interfacial adhesion of composites (Fig. 6), and it has been pointed out that a high interfacial adhesion could be effective in transferring stress but not very efficient at consuming energy (Luo et al. 2014). As shown in Fig. 8c, the 3% modifier-treated composites had a lower loss factor than the 0% modifier-treated composites, indicating that the 3-aminopropyl(triethoxy) silane modification reduced the viscosity of composites but enhanced the elasticity of composites (Ren et al. 2014). This result might be associated with the better interfacial adhesion formed in the 3% modifier-treated composites (Ren et al. 2014). 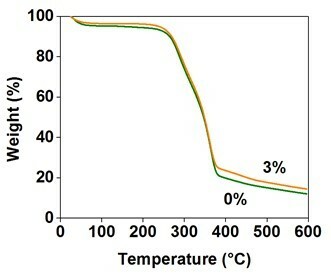 The thermogravimetric data of the 0% and 3% modifier-treated composites are shown in Fig. 9. From room temperature to 200 °C, the weight loss of natural fiber composites was mainly caused by dehydration (Li et al. 2014). In this stage, the 3% modifier-treated composites lost less weight than the 0% modifier-treated composites. This might be because the 3-aminopropyl(triethoxy)silane modification enhanced the hydrophobicity of veneer surfaces (see Fig. 5), making the composites have a lower hygroscopicity and moisture content. In the range of 200 °C to 600 °C, the weight loss of natural fiber composites was mainly caused by the pyrolysis of hemicellulose (200 °C to 300 °C), cellulose (300 °C to 400 °C), and lignin (400 °C to 600 °C) components in wood (Li et al. 2014; Guan et al. 2016). In this stage, the 3% modifier-treated composites lost less weight than the 0% modifier-treated composites. This might be because the 3-aminopropyl(triethoxy) silane modification enhanced the interactions between the veneer surfaces and polyvinyl chloride films (Fig. 6), which could limit the exothermicity of pyrolysis reactions, making the composites have a higher resistance to pyrolysis (Li et al. 2014). New plywood composites were successfully prepared from the surface modified veneers and polyvinyl chloride films. The optimum levels of the four independent variables were 183 °C (hot-pressing temperature), 74 s/mm (hot-pressing duration), 312.5 g/m2 (adhesive dosage), and 3% (modifier dosage). The 3-aminopropyl(triethoxy)silane modification enhanced the hydrophobicity of veneer surfaces and improved the interfacial adhesion and physical-mechanical properties of composites. Compared with the 0% modifier-treated composites, the 3% modifier-treated composites had a 37.4% and 4% decrease in the water adsorption and thickness swelling, respectively, and had a 21.6%, 24.6%, and 29.0% increase in the flexural strength, flexural modulus, and shear strength, respectively. The 3-aminopropyl(triethoxy)silane modification improved the thermal stability of composites. Under high temperature, the 3% modifier-treated composites had a lower loss factor, and lost less weight than the 0% modifier-treated composites. The physical-mechanical properties of both the unmodified (with 0% modifier) and modified composites (with 1%, 3%, and 5% modifier) met the requirements in Chinese national standard GB/T 9846 (2015) for the water-resistant plywood, indicating the potential of proposed composites as new building materials. This research was supported by the National Natural Science Foundation of China (31670571), Beijing Natural Science Foundation (6162019), Co-built Foundation with Beijing Municipal Education Commission “R & D on Key Technology in Scientific Utilization of Non-wood Plant Raw Materials” (2016GJ-01), Co-built Foundation with Zhejiang Province “R & D on Natural Fiber Composites and Environmentally Friendly Adhesives” (CZXC201410), and the Fundamental Research Funds for the Central Universities of China. The authors are also grateful for technical support from the Chinese Academy of Forestry, Zhejiang Chengzhu Advanced Material Technology Co., Ltd., Anhui Sentai WPC Group Co., Ltd., and Mr. Zaihua Shen. GB/T 17657 (2013). “Test methods of evaluating the properties of wood-based panels and surface decorated wood-based panels,” Standardization Administration of China, Beijing, China. GB/T 9846 (2015). “Plywood for general use,” Standardization Administration of China, Beijing, China. Liu, R. (2015). Preparation and Properties of Organo-montmorillonite Modified Wood Flour/Poly(lactic acid) Composites, Ph.D. Dissertation, Beijing Forestry University, Beijing, China. Article submitted: April 11, 2017; Peer review completed: August 3, 2017; Revised version received and accepted: September 10, 2017; Published: September 21, 2017.